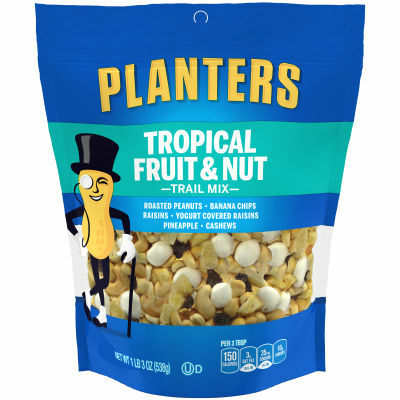 Planters Tropical Fruit & Nut Trail Mix is a fruity, nutty and sweet mixture of six different snacks including roasted peanuts, banana chips, raisins, yogurt covered raisins, pineapple and cashews. - Go Tropical! - Grab your 19 oz. resealable bag of Tropical Fruit & Nut Mix and head out to the nearest beach. No sunshine in sight? Enjoy your trail mix in the comfort of your home and let the flavors remind you of summer fun. Serving size 3 Tbsp (30g).